Happy Easter!Easter is the most important and oldest holidays of the Christian Church. It is the celebration of the resurrection of Jesus Christ and falls between March 21st and april 25th, on the first Sunday after the first full moon following the northern spring equinox. In my family, we really never followed the Italian tradition of "Natale con i tuoi, Pasqua con chi vuoi" - Christmas with family, Easter with friends. It was always a family hoiday - and still is. I have lived far away from family now for over 28 years and so Easter was spent with our children. This year for the first time in many, many years, my husband and I spent Easter alone. So I kept dinner pretty simple. 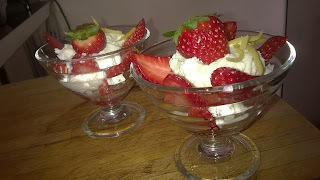 But this morning I decided that I couldn't really fudge on the dessert so I invented this quick, easy, delicious dessert! 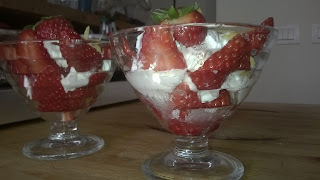 I didn't sugar the strawberries for Franco's "sundae", I sugared lightly sugared them for mine. It really is quite simple to make, and if I do say so myself, scrumptious!! Place the mascarpone, Limoncello, lemon rind and lemon juice in a small bowl and beat with a fork until well mixed, It will not be fluffy. Now in a sundae dish, layer the sliced strawberries and mascarpone mix. I lightly sugared the layers of strawberries for mine.